"Sampath Speaking" - the thoughts of an Insurer from Thiruvallikkeni: people don't talk about 6 - but of denied singles and ... cric bars. people don't talk about 6 - but of denied singles and ... cric bars. The word Cricket attracts me so much that I keep watching and posting something on that so regularly. Before we see something on T20 that India lost, down under, George Bailey has stood down as Australia's Twenty20 captain to focus on his World Cup preparation and increase his chances of a Test recall by playing more first-class cricket for Tasmania. Bailey has also made himself unavailable for Australia's upcoming T20s against Pakistan in the UAE and at home against South Africa, although he has not retired from the format. Wonder would anybody else daring do such things. Remember George Bailey has led Australia in two World T20 campaigns and now at 32, was one of the beneficiaries of Australia's change of selectors in 2011-12, when the new chairman John Inverarity named him as the new T20 captain despite having never played an international match. Recently I posted on ‘Winning fights increases aggression, even in cricket’. The article stated that the more victories someone notches up in fights, the more aggressive they become - and the same is even true for crickets – not of the game, but of the nocturnal insects often confused with grasshoppers. The male crickets chir; sound is emitted by the stridulatory organ, a large vein running along the bottom of each wing. 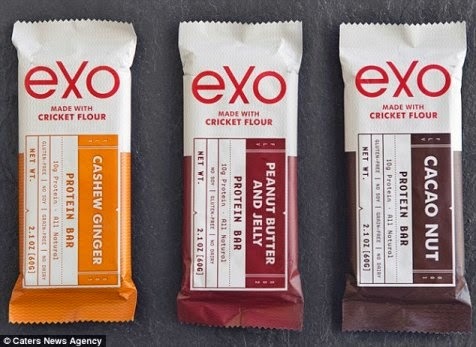 The report states that a food company has created a range of energy bars made from ground up crickets. Its makers say that the bars are a more sustainable source of protein than other, animal-based alternatives. The protein bars are created using cricket flour which involves removing the moisture and grinding them up. Exo, the company behind the product, makes this energy booster, which comes in Cacao Nut or Peanut Butter and Jelly flavor. Even in Western world, there is stigma in the Western in eating insects. The bars come in at £22 plus postage for a pack of 12, and one can choose from three flavours. Now see Edgbaston this way …………. In the 18th over Jadeja was run out and at the end it was 26 runs off 12 balls. The not so experienced Gurney was the bowler … Rayudu faced – 2 off first, 2nd a wide and then a leg bye; 3rd Dhoni whacks almost a six but ends up inches short; 4th a single; 5th and 6th were dot balls…. Yes… Rayudu could not score… so after 19, India required 17 off last 6. Over the years Dhoni has finished in style. Eranga will tell you ……. Often Dhoni pulverizes the bowler – takes charge towards the end and in the final over – of the first or second hits a six – a huge one – demoralizing the bowler – he takes his own time, walks hither and thither – taps the ground – tries to unsettle with a helicopter – ball seemingly disappearing. Needing 17 – here too the first ball of Woakes disappeared for a 6; 2nd slower ball – hit to the deep – a single, but seeing the throw wayward, Dhoni hares another; 3rd pulled to mid wicket – Dhoni refused a single. 4th clubbed over mid off runs for a boundary …. Now 5 out of 2…. 5th hit to deep square, Dhoni denies a single……….. and could not dispatch the last ball over the boundary …… Mooen fields and England starts celebrating. Fought valiantly, have won in such circumstances earlier, trusted himself … failed this time – that’s all…. Nauseating and ridiculous to some (that is about the Cricket bar that you see at the start of the post) …. but it is out there in the market. With regards – S. Sampathkumar 8th Sept. 2014.